November’s Grape Trip : "Burgundy Wine Auction Race & Revelry"
I’ve been mentioning it in our Grape News newsletters, and on my Grape Journal blog, and here it finally is – the complete details and itinerary of our very first Grape Trip! Our Grape Trips mingle sports (for all levels of athletes, including non-athletes! ), gastronomic, and cultural adventures in Burgundy’s famed vineyards and restaurants. November’s Grape Trip, which we are calling “Burgundy Wine Auction Race & Revelry” is all about taking part in Beaune’s world-famous wine auction and three day long street party in November. 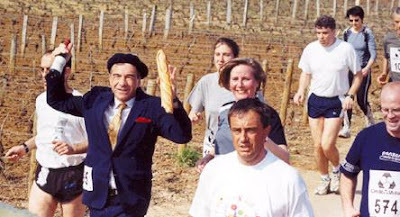 The festivities include a 10.8 kilometer race as well as a half-marathon through some of the world’s most prestigious vineyards and winemaking villages such as Pommard, Volnay, Meursault, and of course Beaune itself. All participants are awarded a bottle of local wine as a souvenir – how many other races in the world can make the same boast? The itinerary that Franck has put together is all about having a once-in-a-lifetime French experience that only a local guide like Franck can provide. Highlights, outside of the Wine Auction and race itself, include a night run with local runners around the medieval walls of Beaune, winetastings at the small wineries of some of Franck’s closest friends, and meals at rustic local eateries that only the locals know about! This trip has a maximum of 10 spaces and the price is a special, introductory one. Please contact me at laura@graperentals.com if you would like any further information at all or would like to reserve your spot. As usual, please feel free to pass on this information to any friends, family or acquaintances that you think might be interested in this special corner of France. This entry was posted in Burgundy and France Travel Info., Grape Trips on September 12, 2009 by admin.